No Tape Mounting, uses existing holes under the hood of the vehicle. Sleek and low profile, the WeatherTech Easy-On Stone & Bug Deflector is aerodynamically designed to provide excellent protection against stone chips and bug stains. Made from aerospace-grade acrylic, it is virtually indestructible and extremely scratch resistant. Attaches easily to most SUVs, trucks, minivans or cars using either a 3M brand automotive adhesive tape or fasteners that use existing holes in your 2003 Ford Expedition / Expedition EL's hood. No drilling is required. A beautiful and protective addition to any vehicle. Fast shipping and very easy installation. After removing the rubber strip, installation took 10 minutes! I have more photos but it appears I can only add one. Great protection. Perfect Fit. You guys rock! I purchased the Weathertech bug deflector because it mounted without drilling and required no double-sided tape to install. The fit is perfect, the installation was simple. The diamond-pearl color is a $1000 option so I had to protect the hood! I also purchased the Tech-shade sunshade for the windshield. It was a perfect fit and construction is heavy-duty. Thank you Weathertech! Nice deflector and looks good! Overall very happy. It fit my 2015 Kia Soul + well. Note that it does cover the KIA logo on the hood. My only complaint was that the tape on one side was a little crooked and not even. It still went on well and I hope it helps protect my car. It comes with 4 small clear rubber "feet" that you are supposed to apply to the hood of your car. I did not and instead installed them on the back of the deflector itself. I wanted as little installed on my car as possible. I can't see the difference as to install them on the back of the deflector or the car itself. Overall I am happy and would buy again. No drilling required! Yeah! I got this along with the Weathertech carmats, cargo liner, and bump step. I am happy with the products. I do recommend the investment. Really happy with the protection the deflector offers - it does a great job defending my hood from all variations of bugs and rocks. Easy install, no drilling and looks great on my truck. My bug/stone deflector was one of the first things added to my new car, after the floor and cargo liners (weathertech of course). I recently heard a rock hit and fortunately the deflector took the hit rather than my paint. I bought my Rav4 in September and for Christmas all I wanted was goodies to protect it. I got the bug/stone deflector and the side window deflectors. I love them. My car is eight months old and the bug/stone deflector has kept it free of rock chips. Also had a few mishaps with my coffee and the floor liners have kept me covered. I highly suggest weathertech anything to everyone who will listen. Struggled a bit with installation. My truck is brand new and I didn't want to mar the finish with the included clips but the rubber bumbers work well and with a little patience, I managed to get this securely attached. Very nice. Fits snug. Looks sharp. Does the job! I've used WeatherTech products on the last 5 vehicles we've owned. Always had good results, easy to install, and look fantastic. 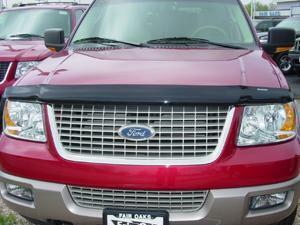 I just now ordered the Bug / Stone deflector for my sons 2012 Nissan Frontier Crew-Cab for his Christmas gift. I'm betting he will order the Vent Visor package to match the sporty look on his hood protector. No need to look at competitor products or pricing, you get the best use and service from WeatherTech! I installed my Stone & Bug Deflectors and the hood will not close. Am I doing something wrong? Some vehicles are manufactured with a “bumper stop” or “hood bumper”. These features often need to be adjusted in order for the hood to close properly. In some cases, the hood might just need to be pushed down to latch properly. Be sure to follow the installation instructions carefully as completing the steps out of order can lead to similar issues. Will the tape damage my paint if I wish to remove the Stone & Bug Deflector? No. The Stone and Bug Deflector uses a special automotive adhesive that does not remove, scratch, or fade paint.